2013 was a great year for films. This one ranked 2nd in my top ten of that year. Alfonso Cuaron is also one of my favorite directors, but this film is a step away from what he’s usually done. Many argue that the film is about overcoming adversity. This is true, but according to my own interpretation I feel that the film explores much more than that. The film Gravity, at its core, is an existential argument. The questions the film poses are: what is the point of living? What is there to live for when there is nothing left to live for? The film then goes on to answer these questions by showing us the struggle for us to not only understand the answers but to also live with them. A traumatizing experience precedes before we ask ourselves what the purpose of life is, and the film shows us how we undergo this spiritual journey when life makes a decision for us that affects us on a deeply emotional level. 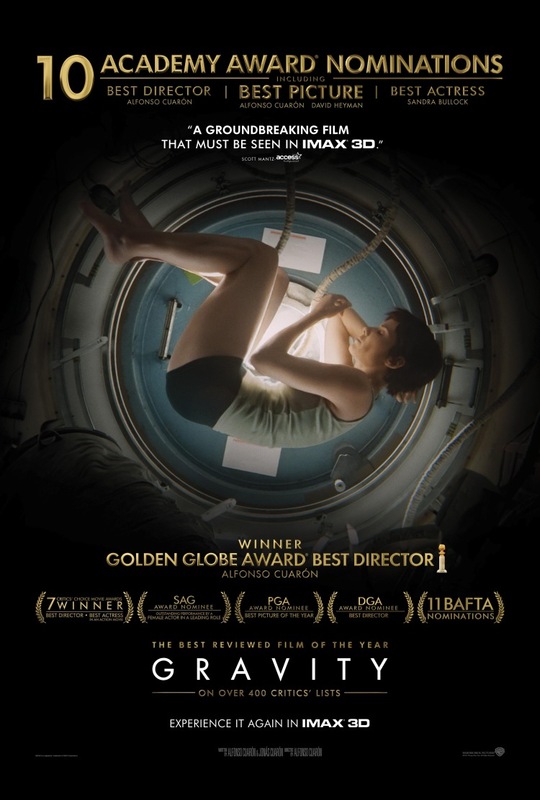 Sandra Bullock plays Dr. Ryan Stone, a rookie medical engineer who is on her first space mission. Her character is tasked with having a spiritual rebirth to come to the conclusion of how much her life is worth and whether or not it’s worth fight for after the death of her daughter. The film’s tagline is don’t let go, but that’s not our choice to make. This choice of not letting go will become apparent later on. After high speed debris strikes the Explorer shuttle that she and George Clooney’s character, Lieutenant Matt Kowalski, a veteran astronaut, were working on, Dr. Ryan Stone is detached from the shuttle and floats off into space. A short while later, Kowalski rescues her and attaches a tether to her suit in order to steer her to safety. Kowalski acts as a caregiver to the dependent and naïve child that Bullock represents at the beginning of the film. Kowalski’s character is forced to detach himself from her in order to assure her survival. The dependent child is abandoned by the caregiver and is sent off to the world in order to make it on her own, much like a bird being pushed to fly. The umbilical cord has been cut. Upon entering a space station, there is a shot of Stone positioning herself as a sleeping fetus in the womb. We are then shown that this emotional awakening will not be simple through the events that subsequently occur, but the final scene of the film shows Stone’s escape pod landing in a lake. This is representative of the ‘water breaking’ and a baby being born. When reaching the shore, like a child in its first years of living, Stone struggles to stand but ultimately regains her composure and can finally stand on her own two feet. She walks away and is now fully independent. She has fought for her life that was rendered meaningless but has now been earned. The film does a great job at showing what a person’s world is like when faced with these challenging questions. Space is representative of this exact world, a void that has nothing in it but has endless possibilities and endless roads that one can take. Gravity is also a great expression in minimalist filmmaking, showing you exactly how much can be done, even on a grand scale, with so little. Lack of character development would be the only complaint I’d have against the film. The characters could be seen as cliché, with Clooney’s retiring astronaut and Bullock’s novice rookie being a team that we’ve seen time and time again. However, this can be overlooked. The film explores a very intimate point in our lives that we universally share. It’s been two years since the film was released and it’s still on my mind. When you make a film that generates discussions long after it’s been shown, you know you’ve created something great. The plot is easy to summarize: A young admirer of a famous stage actress tries to get her attention with nice bouquets of flowers, but she doesn’t pay him any mind. That is, until her crush marries someone else besides her, and she decides to marry the young admirer out of spite. Even from the onset, the film’s energy, and any great Buster Keaton movie crackles with energy from the beginning, seems lacking: a great gag here and there, no doubt, but it seems almost textbook film material at hand. That all changes when the only improvised scene in the entire film rolls on: Buster Keaton, playing Elmer in the film, tries to not wake up his drunk wife and to position her on the bed for a proper night’s sleep. Dorothy Sebastian, who plays the spiteful stage actress Trilby Drew, is the other half that makes this movie works so well: combine Buster Keaton’s earnestness in his character and his attempts at being with his new wife, with Dorothy Sebastian’s portrayal of a star that couldn’t give a toss less about her husband and who is deeply spiteful in all other regards, and you have a quality film in the making. The film really becomes a Buster Keaton production at the tail-end of the film, where, by extenuating circumstances, Elmer finds himself alone on a ship, with his beloved wife and him going against some pirates boarding the ship. The slapstick, comedic timing, and performances coalesce into an incredible ending sequence. Spite Marriage may be the last good Buster Keaton-era movie, and it becomes an even better one when he cuts loose at the end. Unfortunately, the next Buster Keaton film ruined his career. And that film is known as Free and Easy.